The robot the students designed and built to use at their robotics competitions. 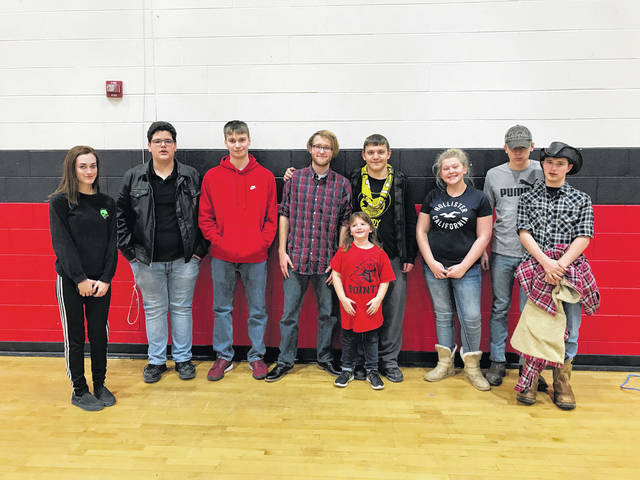 Pictured are students from the PPJ/SHS VEX Robotics competition team, from left, Cheyenne Rollins, Noah Scarbrough, Dylan Stewart, Nate Spence, Randall Moerika, Brianna Thornton, Donnie Mayes, Andy Workman, and one of their fans Chloe Bunner. POINT PLEASANT — Students at Point Pleasant Junior/Senior High School (PPJ/SHS) have an opportunity to be involved in a scientifically engaging activity, both during class time and after school. Last year, the VEX Robotics Competition program was introduced to PPJ/SHS students and staff when a gentleman from NASA visited the school, according to James Bunner, science teacher/robotics instructor. The NASA representative showed the students how to build a claw-bot and how to do basic robotics programming. NASA also donated parts of a robot to the school. VEX Robotics is sponsored through NASA and is a nationwide program. PPJ/SHS students have been participating in West Virginia competitions since last year. Bunner said last year his students competed in five meets and even qualified and participated at the state level competition. To be on the competition team, students middle school through high school can join. Also, PPJ/SHS has an after school robotics class as a part of its PATCH program which is open to both middle school and high school students. This year, Bunner also started a robotics class at the high school which is open to freshmen through seniors. Recently, PPJ/SHS was the host school for a VEX Robotics Competition. Bunner shared this competition was a West Virginia state qualifying meet. The students have already competed at Marshall University in Huntington and have a few upcoming state qualifying meets within the next few months. They will be traveling to South Charleston for their upcoming meet. Bunner has 13 students in his robotics class and three additional students in his PATCH after school robotics class who are on the competition team. At the last meet, six of the students competed and the other students helped with other areas of the competition such as with concessions, admission, and setting up the event. All of the students helped with field set up as the field for competitions are a unique element each year. At the competition, PPJ/SHS students competed against 20 other teams and there were seven total matches. Bunner explained each match lasts for two minutes and there are four robots on the field at one time. 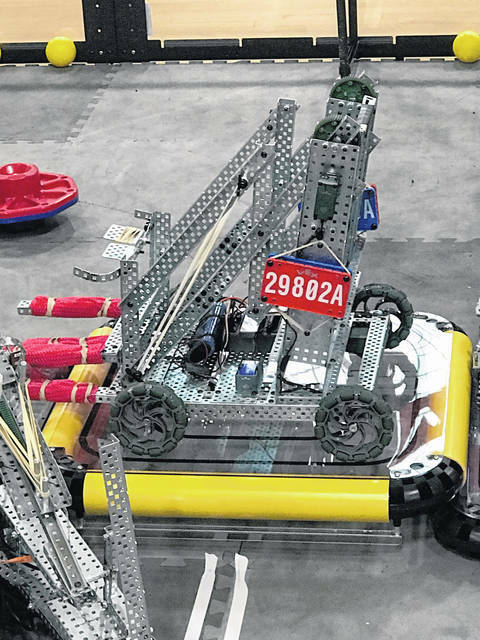 During the first portion of the match is an autonomous period where the robots navigate the field by themselves for 15 seconds. The judges assess the robot and the students’ programming and award points. Then the second portion of the competition begins which lasts for one minute and 45 seconds and is the driver control period where the judges assess manual control of the robot. During this portion, the robot is controlled by a team, the teams competing pair off. The judges tabulate the scores from the first portion and second portion and the team with the most points wins the match. Bunner shared NASA has helped with supporting the robotics programs at PPJ/SHS. Also, Bunner received a grant towards the programs from the Robert and Louise Claflin Foundation and the county donated parts for the competition robot. The robotics students have also been doing fundraisers throughout the year. PPJ/SHS will be holding an open house showcasing the after school PATCH programs offered at PPJ/SHS on Tuesday, Feb. 19, beginning after school until approximately 6 p.m. The robotics class will be showcasing their competition robot.